Last week I wrote about the dangers of perfectionism, and how trying an attitude of ‘good enough’ might be the thing that helps break through the fixed thinking that creates it. This week, just to be contrary, I’m going to warn you about the dangers of relying upon ‘good enough’ as a standard. Do you rely upon things being ‘good enough’ and risk losing out on improvement? A teaching experience of over twenty-five years in a psycho-physical sphere has given me a very real knowledge of the psycho-physical difficulties which stand in the way of many adults who need re-education and co-ordination, and, as the result of this experience, I have no hesitation in stating that the pupil’s fixed ideas and conceptions are the cause of the major part of his difficulties. Alexander firmly believes that a student’s fixed ideas are their stumbling block: their ideas about “doing it right;” about doing things “their way;” their ideas about what they can’t and can’t do. Frankly, from my own experience, even something as apparently simple as a student’s belief about the location of their hip joints can prove a stumbling block to their improvement! Believing in stopping searching for something better is just such another idea. I have a friend who laughs at me because I am always trying out new recipes. For example, I have two or three classic chocolate cake recipes that I use frequently, but that doesn’t stop me trying out new ones. After all, how do I know that the recipes that I have are the best? By choosing to settle for them (they are, after all, very good), I might miss out on a recipe that is truly amazing. Similarly, when trying to solve his vocal problems FM Alexander found that preventing the pulling back of his head also stopped the depression of his larynx and the sucking in of breath – and his vocal condition improved. This improvement was even confirmed by medical friends. But if FM had settled for preventing the pulling back of his head he would never have thought about the relationship between his thinking and the direction of his movement, and we wouldn’t have the Alexander Technique. He would have had a nice acting career in Australia, and I’d be teaching something else. So I think we should be grateful that FM didn’t own the conception ‘good enough for the bush’ (yes, that’s an Aussie expression). We would have missed out on a tool that stresses (almost?) unlimited potential and continual improvement! So next time you settle for ‘good enough’, just take a moment to check back in your mind, and see if you can count up how often you take that option. Maybe it’s time to try a new recipe. Alexander, F.M., Constructive Conscious Control of the Individual, Irdeat 1997, p.294. Making mistakes in musical performance: should we aim for perfection? I worked with a student recently who has been having problems with mistakes onstage, even in music the student knows really well. My student described the mistakes as coming out of nowhere, and creating a sudden loss of focus that resulted in further errors. The student wanted help from me to eliminate the mistakes. But what if the mistakes aren’t really the problem? What if we are really suffering from a completely different problem: a mindset issue? Last month I attended a training day run by BAPAM on anxiety and heard a great talk on perfectionism by psychologist Dr Radha Kothari. One of the markers suggested by Dr Kothari for an unhealthy perfectionism was a performer’s attitude towards mistakes: are they something to learn from, or something to be avoided? 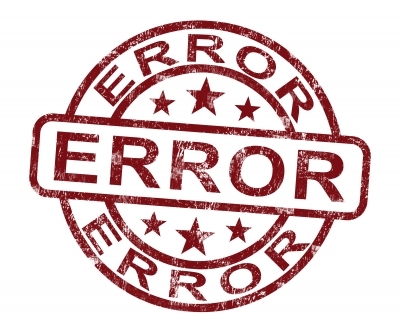 If we believe that mistakes are something to avoid, then we are likely to engage in behaviours that are unhelpful: we will get unduly nervous before performing out of fear of the mistakes occurring; we may start avoiding practice sessions; we may notice physical tension building when we are coming up to the passages where we think we are most likely to ‘fall off’. Mistakes matter when we hold the belief we are aiming for perfection; that is to say, when we believe that it is possible to give a perfect performance. Mistakes are clearly not included in anything perfect, so logically, mistakes take us away from perfection and towards failure. Except… perfection isn’t really possible. As an example, just think of how many recordings have been made and performances given of Beethoven’s Fifth Symphony. Many of them will have been good; some will have been great; a number will have been excellent. But can we really label any one performance as perfect? Does that even make sense as a concept?! The implication of his statement is that our beliefs, if they are merely ‘trifling’ and ‘mechanical’, are utterly changeable. They aren’t giant pits or bear traps; they are potholes. If we can fall into them, we can lift ourselves back up out of them and keep walking. We can notice the belief, and then change it. My student’s attitude towards mistakes was an indicator of a mindset – a belief about perfection – that I suspected was not helpful. So I asked a question that suggested a change of mindset: “Which would you rather: perfection or excellence?” My student’s face lit up instantly. One change of word, and everything changed. My student reported a vastly increased fluency and enjoyment while playing, which was still evident (and increasing) weeks later. If you strive for excellence, mistakes are expected. They are something to learn from. They are a source of information, and an occasional bump in the road. Nothing more significant than that. So how will you view your mistakes today? British Association for Performing Arts Medicine. They’re fantastic. FM Alexander, Man’s Supreme Inheritance, Irdeat ed., p.52.